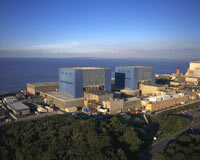 Hinkley Point A Site is located on the Somerset coast about eight miles from Bridgwater. It is neighboured by a generating station and a new build site, both owned by EDF. The site began construction in 1957 and generation began in 1965. It has two Magnox reactors which are being decommissioned following their final shut-down in 2000. It was the first station in the Magnox fleet to generate more than 103TW hours of electricity. The site is currently being prepared for entry into care and maintenance.